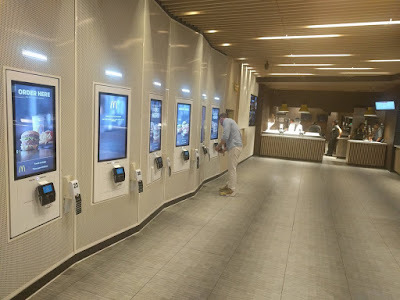 Franchise Equity Group - MMGA: Kiosk Overkill? Where is that located at? Not sure, it popped up on one of Oak Brook's fake Twitter accounts. I assume it's in Chicagoland. The cost of EOTF means more debt for many Operators. The technology, such as mobile ordering, etc. will be a challenge, as Mcdonald's is always behind the industry when it comes to technology. Also, we continue to make the restaurants more difficult to operate for our employees, while we continue to struggle to staff the restaurants. Modern and progressive at your expense. Every year, McDonald's becomes a higher risk investment for franchisees. Many Owner/Operators won’t be able to afford it but will not sell their stores so a big chunk of the stores won’t have the changes for years. McDonald’s USA management doesn’t know much about McDonald’s so they are out over their skis on the timetable. No restaurant or operations talent left in Oak Brook, just a bunch of accountants.